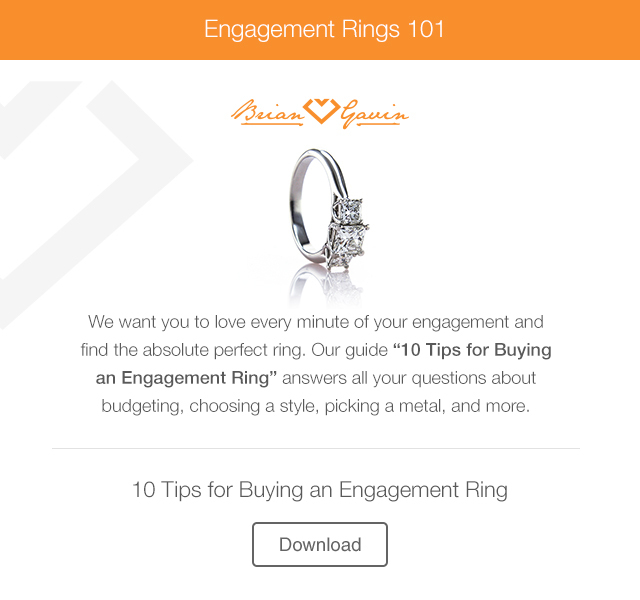 Complete Guide: What are the Benefits of Hearts & Arrows Diamonds? How accurate are those diamond cut calculators? 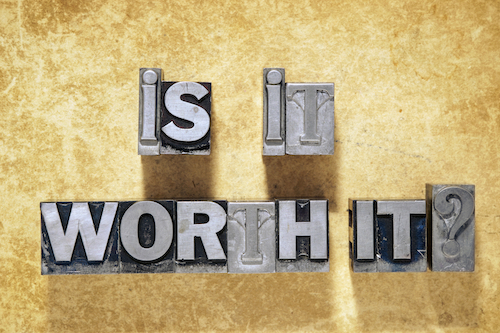 Should I Buy a Round or Princess Cut Diamond Ring? 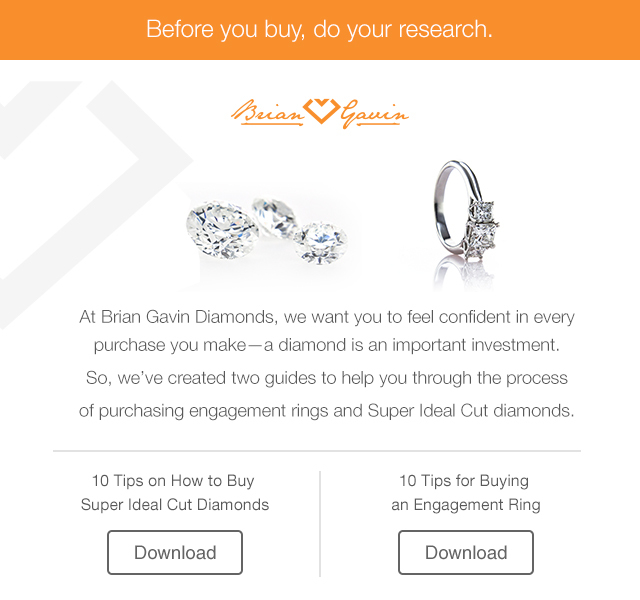 What are the Benefits of Hearts and Arrows Diamonds? The proportions of a round brilliant cut diamond dictate the volume of light return and affect the balance of brilliance (white sparkle) and dispersion (colored sparkle) exhibited by the diamond. 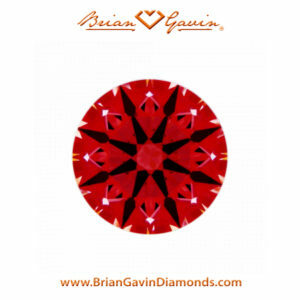 Brian Gavin Signature round diamonds are produced to exacting standards, which require the proportions of the diamond be within a specific range which is well recognized for producing the highest volume of light return and the best balance of brilliance and dispersion. Other factors such as the length of the lower girdle facets will have some effect upon the size and intensity of the sparkle. 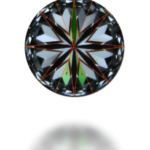 Polish and Symmetry will also have an effect upon the sparkle factor of a diamond. These are factors of diamond cut quality which are graded by the major gemological laboratories, and which most people are familiar with to some extent. The little-known factor of diamond performance, which is rarely discussed because it is difficult and costly to achieve, is optical precision. This the consistency of facet shape, size, and alignment, judged from the perspective that it applies to the diamond as a three-dimensional model. The term “Optical precision” refers to the consistency of facet shape, size, and alignment on the surface of the diamond from the perspective of 360 degrees. Optical precision differs from the standard symmetry grade that appears on diamond grading reports, which is “meet point symmetry” and primarily applies to how well the facets meet up at the junction points. We use a Hearts and Arrows Scope to judge optical precision in cushion and round brilliant cut diamonds. The H&A Scope differs in design from the ASET and Ideal Scopes which are designed for different purposes. The hearts and arrows scope pictured to the left features plastic discs which serve to reflect white light off the facets of the diamond. The plastic tube in the lower half of the scope contains a red piece of film which serves to filter the light entering the diamond to create contrast. 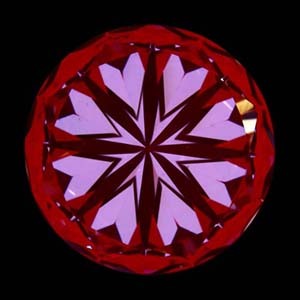 The diamond is placed upside down on a round disk (not featured in picture) underneath the Hearts and Arrows Scope so that we can see the hearts pattern and judge the degree of optical precision. 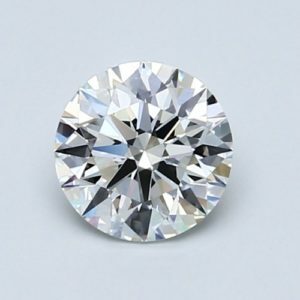 Diamond Buying Tips: Do not be fooled by vendors who try to convince you that ASET, H&A Scope, and Ideal Scope images are interchangeable because each “reflector scope” is designed for a specific purpose and provides different insight into the optical properties of polished diamonds. 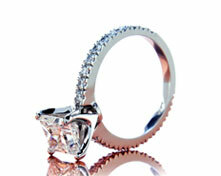 It is a common misconception that all all ideal cut diamonds exhibit patterns of hearts and arrows. This myth is based on the premise that light reflecting off the pavilion facets creates the hearts pattern when the diamond is viewed from the bottom, while the eight pavilion main facets create the arrows pattern that is visible from the top. The image on the left shows the main pavilion facets outlined in orange, and a main pavilion facet reflecting on the opposite side in the lower girdle facets on either side of the opposite main pavilion facet highlighted in green. The steeper angle of the lower girdle facets causes the new forming heart to separate from the arrow head. Any difference in the length or size of the lower girdle facets will affect the size of the pavilion main facets (highlighted in orange) which will alter the size of each side of the hearts. The truth is that it is relatively easy to cut a diamond to ideal proportions and achieve AGS Ideal-0 or GIA Excellent polish and symmetry. However, it is quite another thing to polish the facets of the diamond with the precision necessary to create a consistent pattern of hearts and arrows. Which is why true Hearts and Arrows cut diamonds account for about 0.001% of the annual production for round brilliant cut diamonds. Brian Gavin Signature hearts and arrows diamonds are cut to exacting standards. 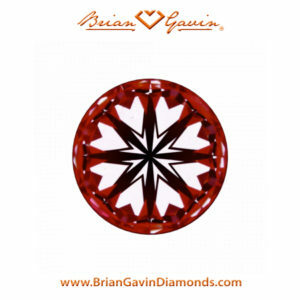 In fact, it’s been said that Brian Gavin sets the standard for hearts and arrows diamonds. As you discovered in the section above, not all ideal cut diamonds exhibit crisp and complete patterns of hearts and arrows. With that in mind, it makes sense that not all diamonds with an overall cut grade of AGS Ideal-0 or GIA Excellent will exhibit hearts and arrows. The terms AGS Ideal-0 and GIA Excellent refer to the highest cut grade available from the AGS and GIA gemological laboratories. 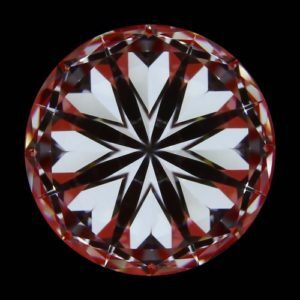 Neither the AGS nor the GIA take optical precision into account as part of their overall cut grade. As stated previously, you must use a hearts and arrows scope to judge the optical precision of a diamond. It is also important to realize that each cut grade represents a range or spectrum of possibility. Thus, you will find that some ideal cut diamonds are cut to proportions that represent the target zone or “sweet spot” for ideal proportions, while others are cut to the outer edge or fringe of the range of proportions which is known to produce better light performance. Diamond Buying Tips: Don’t be fooled into thinking that all ideal cut diamonds exhibit crisp and complete patterns of hearts and arrows. Diamond proportions are only one piece of the puzzle. The degree of optical precision combined with proportions determines whether or not a diamond will exhibit a hearts and arrows pattern. This GIA Excellent cut round diamond has proportions right in the middle of the target zone for the zero ideal cut rating. The 40.8 degree pavilion angle should produce a high volume of light return. While the 34.5 degree crown angle produces a virtual balance of brilliance (white sparkle) and dispersion (colored sparkle/fire). The 50% star facet length should produce well rounded hearts and the 75% lower girdle facet length should produce broad-spectrum sparkle. The proportions of this diamond are spot-on, and the sparkle factor should be spectacular. The green arrow points to light leakage which is visible under the table facet in both the ASET and Ideal Scope images. The light leakage is not readily apparent in the H&A Scope image, but that is not surprising because the scope is not designed for that purpose. 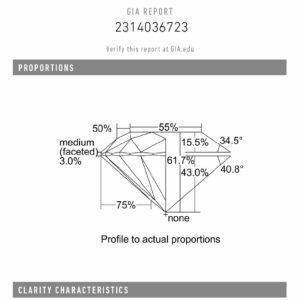 At the same time, this GIA Excellent cut diamond is not leaking as much light as other examples that we’ve seen with proportions within the target zone. The fact that diamonds like this might exhibit a “hearts pattern” will be a point of confusion for many people who might mistake it for a hearts and arrows diamond. But the fact of the matter is that the “hearts” lack symmetry of size and shape. The spacing around the hearts is uneven and the tips of the hearts are twisting, which indicates a lesser degree of optical precision. This GIA Excellent cut round diamond has a 40.8 degree pavilion angle which is offset by a crown angle of 34.5 degrees. It should be exhibiting a high volume of light return and a virtual balance of brilliance and dispersion, but the ASET Scope image (below) shows that it’s leaking light. While it’s helpful to have the ASET Scope image, the reality is that you don’t even need it to know that this diamond is leaking light. Just look at the way light is reflecting around the edge of the table facet in the clarity photograph. Does it look like the light is being evenly distributed? Now take a look at the hearts pattern exhibited by this diamond. The hearts lack symmetry of size and shape and the tips of the hearts are twisting. This GIA Excellent cut diamond lacks the degree of optical precision necessary to prevent the light leakage which is evident in the ASET Scope image. Are all GIA Excellent Cut Diamonds Hearts and Arrows? This GIA Excellent cut diamond exhibits a more uniform pattern of hearts than the other diamonds discussed previously, but it still doesn’t qualify as a hearts and arrows diamonds by our standards. The hearts still lack symmetry of size and shape, and the clefts of the hearts are split in some places, and there is a bit of twisting in the tips of the hearts, and uneven spacing around the hearts. All of these examples clearly show why not all GIA Excellent cut diamonds are “hearts and arrows” even though they might exhibit some sort of hearts pattern. This diamond is leaking light despite the 40.8 degree pavilion angle. Which just goes to show why optical precision is a critical component of light performance. It is truly unfortunate that gemological laboratories, such as the AGS and GIA, do not take optical precision into account as part of the overall cut grade. 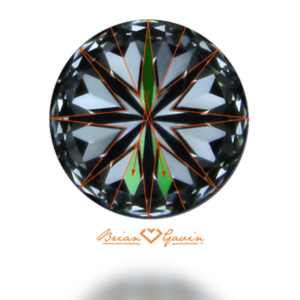 The benefit of buying a Brian Gavin Signature round hearts and arrows diamond versus a standard ideal cut diamond of the same or similar proportions, is that the higher degree of optical precision will produce sparkle which is larger in size, bolder, brighter, and more vivid. Look at the ASET Scope image for the Black by Brian Gavin hearts and arrows diamond pictured to the left. Notice the consistency in the distribution of reds, greens, and blues throughout the image. This ideal cut diamond is clearly exhibiting a higher degree of light return than the ones above. This is the difference between a diamond which offers excellent light performance, and one which exhibits the type of exceptional sparkle factor that people tend to notice from across the room! It can be challenging for people to appreciate the difference between a true hearts and arrows diamond and a standard ideal cut diamond without having the opportunity to compare them side-by-side. 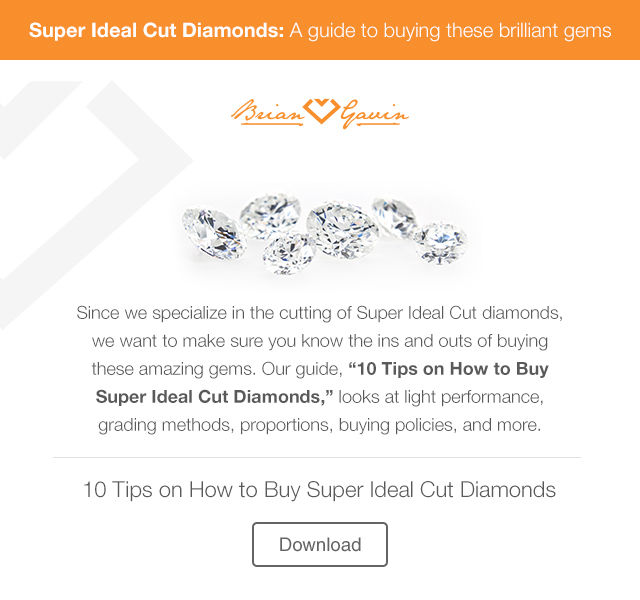 However, the ASET, Ideal Scope, and Hearts & Arrows Scope images provided by Brian Gavin makes it easy to see the performance differences between ideal cut diamonds within the spectrum of optical precision that is available. 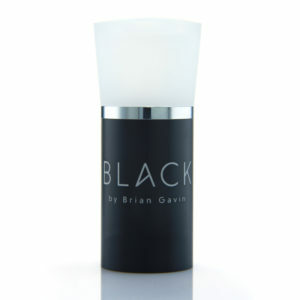 This Ideal Scope image demonstrates the higher degree of light return exhibited by this Black by Brian Gavin diamond. It certainly doesn’t take a rocket scientist to see the difference between ideal cut diamonds of different cut qualities once the reflector scope images are compared side-by-side. But some people find it easier to picture the difference in terms of how it compares with two versions of a performance sports car, such as those in the Porsche 911 series. If you were going to purchase a new Porsche 911, would you prefer the speed and performance of one which is equipped with a turbo charger, and which has been fine tuned to deliver racing type performance? Or would you settle for the standard version of the Porsche 911, as it rolls off of the factory floor out on to the showroom floor with no further fine tuning? If you prefer the heightened performance and speed provided by the turbo-charged Porsche 911 which has been further fine-tuned to deliver racing performance, or the Porsche GT3, then Brian Gavin is the logical choice because our diamonds deliver superior light performance every time. As Brian Gavin is so fond of saying “It’s all in the hearts” which is why our diamond cutters strive to cut every diamond to the highest degree of perfection possible each and every time. Their dedication to cutting the finest diamonds available is matched only by your appreciation of light performance. For more information about Hearts and Arrows – check out our Hearts and Arrows Buying Guide. 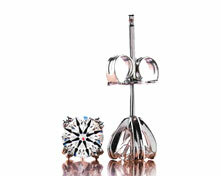 How impressive is a hearts and arrows diamond? This entry was written by Danny, posted on February 11 at 8:35 am, filed under Diamond Education. Bookmark the permalink. Follow any comments here with the RSS feed for this post. Trackbacks are closed, but you can post a comment.